Happy Holidays from the MonkeyGnomes (thanks to Bekah for leading us to such merriment)! 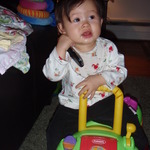 She’s practicing the cell-phone-driving skills. See the walking? And with balloons! The eating of the birthday cake. With much glee in squishing. In other news, we MonkeyGnomes have relocated ourselves further up the eastern part of the country. We’re missing our pals in South Carolina (miss you guys!! hugs! you know who you are! ), as well as our house (which is for sale, so if you know of someone in need of a fab house with a fab pool, let me know, will you? ), as well as the warm weather (we heard it was near 80 this week). 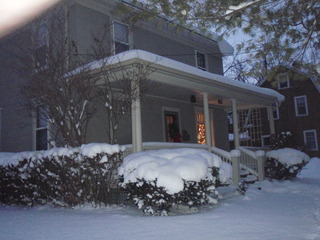 We are in central New York, lavishing ourselves with lots of snow. Hmmm. Ok, I will try to make it less drought-like with coming posts. Maybe more small ones. Or something. I probably will not make another peep till the holidays are over….hope you all have a wonderful Christmas/Hanukkah/hanging out in the winter air. Take good care! Will try making my regular blog-read rounds soon. Happy Happy!! ¹ Made in the USA!